Much attention will be on the next meeting between Chinese President Xi Jinping and US President Donald Trump at the G20 in late November. When G20 finance ministers met in Bali last week to review economic developments in the lead-up to the annual G20 summit, they could not ignore troubling signs in the global economy driven by concerns about an intensifying US-China trade conflict. Last week’s slide in equities markets will have served as a warning – if that was needed – of the risks of a trade conflict undermining confidence more generally. China’s own Shanghai index is down nearly 30% this year. This is partly due to concerns about a trade disruption becoming an all-out trade war. IMF Managing Director Christine Lagarde’s call on G20 participants to “de-escalate” trade tensions or risk a further drag on global economic growth might have resonated among her listeners in Bali, but it is not clear calls to reason are getting much traction in Washington these days. Uncertainties caused by a disrupted trading environment are already having an impact on global growth. In its latest World Economic Outlook, the IMF revised growth down to 3.7% from 3.9% for 2018-19, 0.2 percentage points lower than forecast in April. The IMF is predicting slower growth for the Australian economy, down from a projected 2.9% this year to 2.8% next year. The May federal budget projected growth of 3% for 2018-19 and the following year. Adding to trade and other tensions between the US and China are the issues of currency valuations, and a Chinese trade surplus. In September, China’s trade surplus with the US ballooned to a record U$34.1 billion. This comes amid persistent US complaints that Beijing has fostered a depreciation of the Yuan by about 10% this year to boost exports, which China denies. These are perilous times in a global market in which the US appears to have shunned its traditional leadership role in favour of an internally-focused “America First” strategy. So far, fallout from an increasingly contentious relationship between Washington and Beijing has been contained, but a near collision earlier this month between US and Chinese warships in the South China sea reminds us accidents can happen. This is the background to a meeting at the G20 summit in Buenos Aires late in November between US President Donald Trump and Chinese President Xi Jinping. That encounter is assuming greater significance as a list of grievances between the two countries expands. US Vice President Mike Pence’s speech last week to the conservative Hudson Institute invited this question when he accused of China of “malign” intent towards the US. Are we seeing the beginning of a new cold war? The short answer is not necessarily. However, a further deterioration in relations could take on some of the characteristics of a cold war, in which collaboration between Washington and Beijing on issues like North Korea becomes more difficult. By any standards, Pence’s remarks about China were surprising. He suggested, for example, that Chinese meddling in American internal affairs was more serious than Russia’s interventions in the 2016 president campaign. He accused Beijing of seeking to harm Republican prospects in mid-term congressional elections and Trump’s 2020 re-election bid. This was a reference to China having taken its campaign against US tariffs to newspaper ads in farm states like Iowa. Soybean exports to China have been hit hard by retaliatory tariff measures applied by Beijing in response to a first round of tariffs levied by the US. This is probably true, but it could also be said that much of the rest of the world – not to mention half of the US population – would like a different American president. All this unsteadiness – and talk of a “new cold war” – is forcing an extensive debate about how to manage relations with the US and China in a disrupted environment that seems likely to become more, not less, challenging. Australian academic debate, including contributions from various “think tanks”, has tended to focus on the defence implications of tensions in the South China Sea for Australia’s alliance relationship with the US. This debate has narrowed the focus of Australia’s concerns to those relating to America’s ability – or willingness – to balance China’s regional assertiveness. This assertiveness increasingly is finding an expression in China’s activities in the south-west Pacific, where Chinese chequebook – or “debt-trap” – diplomacy is being wielded to build political influence. Australian policymakers have been slow to respond to China’s push into what has been regarded as Australia’s own sphere of influence. Leaving aside narrowly-focused Australian perspectives, it might be useful to get an American view on the overarching challenges facing the US and its allies in their attempts to manage China’s seemingly inexorable rise. Among American China specialists, few have the academic background and real-time government experience to match that of Jeffrey Bader, who served as President Barack Obama special assistant for national security affairs from 2009-2011. Ever since President Richard Nixon opened the door to China in 1972, it has been axiomatic that extensive interaction and engagement with Beijing has been in the US national interest. The decisive question we face today is, should such broad-based interaction be continued in a new era of increasing rivalry, or should it be abandoned or radically altered? The starkness of choices offered by Bader is striking. These are questions that would not have entered the public discourse as recently as a few months ago. He cites a host of reasons why America and its allies should be disquieted by developments in China. These include its mercantilist trade policies and its failure to liberalise politically in the three decades since the Tiananmen protests. However, the costs of distancing would far outweigh the benefits of engagement to no-one’s advantage, least of all American allies like Japan, India and Australia. American should reflect on what a world would be like in which the two largest powers are disengaged then isolated from, and ultimately hostile to each other – for disengagement is almost certain to turn out to be a way station on the road to hostility, he concludes. Bader has been accused of proffering a “straw man argument’’ on grounds that the administration is feeling its way towards a more robust policy, and not one of disengagement. But his basic point is valid that Trump administration policies represent a departure from the norm. There are risks out there in the system and we need to be mindful of that…bIt’s time to buckle up. That would seem to be an understatement, given the unsteadiness in the US-China relationship and global geopolitical strains more generally. Demoralised Nationals meet on Monday morning to replace Barnaby Joyce, with their deputy leader Bridget McKenzie flagging a push for consensus on the leadership rather than a contest. Late Sunday, only Veterans’ Affairs Minister Michael McCormack, from New South Wales, was a declared candidate after David Gillespie, assistant minister for children and families, pulled out of the race. Agriculture Minister David Littleproud, from Queensland and close to Joyce, was “weighing his options”, according to his spokesman. Several people had urged him to run. McKenzie told the ABC that in the Nationals “conventionally around leadership, there usually isn’t a vote. Joyce will formally resign as leader at the meeting, after his announcement on Friday, in the wake of the scandal over his affair with his former staffer, now his pregnant partner, and a sexual harassment claim made to the Nationals by a Western Australian woman. The claim has set off fresh trauma for the party after the name of the woman who made it, former Western Australian Rural Woman of the Year Catherine Marriott, was leaked. She had wanted her identity kept confidential. McKenzie said she had “absolutely no evidence to suggest that the National Party has been the one to actually put Ms Marriott’s name forward”. She said she had commitments from the Nationals’ federal president and federal director that the party did not breach Marriott’s request for confidentiality. As the Nationals, reeling from recent events, try to regroup, maverick George Christensen, from Queensland, questioned the value of the Coalition for his party. He said the party must choose a leader “who will deliver for regional Australia rather than serve at the table of the elitists’ metropolitan feast in the hope of nicking a few scraps for the bush”. “I believe the formal Coalition is too restrictive. I would rather see a Liberal prime minister, Liberal deputy prime minister, and a full cabinet of Liberal ministers than have to compromise our values and the welfare of the good people we represent,” he wrote on Facebook. 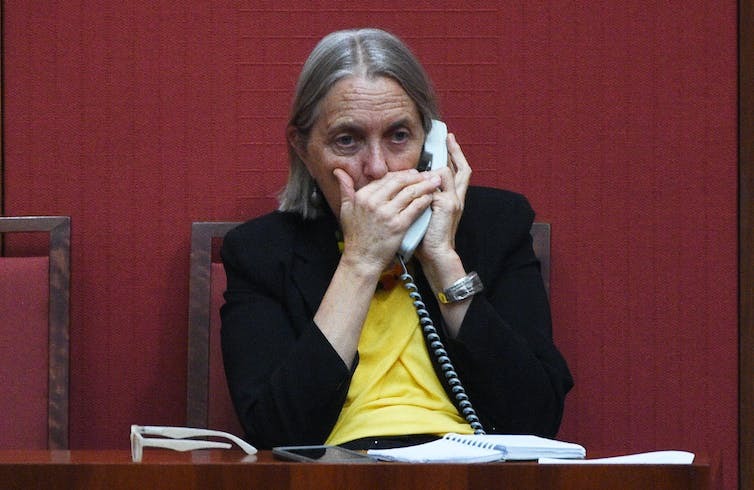 McCormack, 53, entered parliament at the 2010 election representing the seat of Riverina. He is a former journalist and was editor of The Daily Advertiser in Wagga Wagga. While editor he published in 1993 a strident anti-homosexual editorial, for which he had to apologise repeatedly over the years. McCormack is socially conservative but has not had a sharp profile on issues generally, beyond his commitment to regional areas and small business. Littleproud, 41, has had a meteoric rise. He only entered parliament at the 2016 election but was elevated by Joyce from the backbench to cabinet in the December reshuffle. He said it was time for The Nationals to get behind McCormack as leader. This week: There is more to the World Economic Forum meeting in Davos than celebrities and ski resorts. The World Economic Forum’s annual meeting in the Swiss resort town of Davos has become a bit like the Academy Awards. There are lots of celebrities and lots of publicity, but there are legitimate questions about the substance of the whole enterprise. Is the whole thing a palaver? Actually, no. The theme this year is Creating a Shared Future in a Fractured World – and it reflects legitimate concerns about the breakdown of international institutions. The institutions that have guided the post-World War II era are under threat from both the left and the right. US President Donald Trump has decried institutions like the United Nations and threatened to withhold funding. In his campaign he railed against NATO – a vital alliance that has underpinned European security for decades. His nativist agenda, with its America First slogan, is seen by many as a major threat the entire apparatus of international cooperation. Yet a newly energised and combative left also decry many of these institutions as pushing a “neoliberal” agenda. The hero of the American left, Bernie Sanders, went as far as to blame the International Monetary Fund for the Greek debt crisis. And Britain’s putative Prime Minister Jeremy Corbyn has widespread contempt for the international financial order, even agreeing with the accusation that he is “a bigger threat than Brexit”. It is unlikely that this clash of ideologies is going to be solved this week. But against this backdrop, there is a more traditional international game being played: lobbying for national interests and positioning for national advantage. US Treasury Secretary Steve Mnuchin declared that the US “is open for business”, and according to administration officials, Trump will purportedly say similar things when he attends on Friday. The World Economic Forum is one of the best, most efficient opportunities to engage over a very short period, in one single location, with a very large number of senior political, business and community leaders from right around the world. It’s a critical time to defend free international trade. The US has pulled out of the Trans Pacific Partnership, but the other 11 countries (including Australia) are set to sign the so-called Comprehensive and Progressive Agreement for Trans-Pacific Partnership (CPTPP) deal. Yet there are sceptics and critics of such deals at home and around the world. At Davos yesterday, German Chancellor Angela Merkel rightly warned that despite the challenges faced by the world economy, “protectionism is not the proper answer”. In Australia, it’s unclear yet what Labor leader Bill Shorten’s reaction to the CPTPP will be. He declared the original TPP “dead” when the US pulled out, but the CPTPP still holds significant benefits for Australia. New modelling by the highly respected Petersen Institute for International Economics suggests that although the overall benefits of the CPTPP may be lower, Australia will do nearly as well as under the larger agreement with the US involved. The reason is that without the US, Australia will get a bigger share of markets like Japan and Mexico, for products like beef, that it would otherwise have had to share with the US. Shorten’s response to this good but inconvenient fact (for him) will be telling. An array of Australian business leaders will also be in attendance, and it’s an important time for Australian business to try to sell Australia as an attractive destination for foreign investment. Australia’s corporate tax rate, at 30%, is now among the highest in the OECD, whereas 15 years ago it was among the lowest. And unless you run a chain of moderately successful smoothie bars and hence have revenues under A$50 million, little tax relief is on the horizon. The real fireworks from Davos might come from President Trump’s public remarks. But it will be the private remarks between senior Australian business leaders and foreign investors that will likely be the most consequential for the Australian economy in the coming few years. The key messages from Thursday’s COAG meeting were about co-operation and a nationally consistent approach to counter-terrorism. Given the persistent and serious threat of terrorism, national discussions about the direction of Australia’s counter-terrorism strategy should be encouraged. However, such discussions require robust follow-up – not merely announcements about “getting tough” on terrorism – if they are to improve responses to terrorism in practice. As might be expected, the key messages from Thursday’s special Council of Australian Governments (COAG) meeting were about co-operation and a nationally consistent approach to counter-terrorism. The COAG discussion also focused on facial recognition software, pre-charge detention, and new criminal offences for terrorism. Interoperability means different government agencies should co-operate effectively, and be willing to share information openly and efficiently. It’s a political buzzword that’s difficult to say and even harder to achieve in practice. In the case of a terrorist attack, this means police and security agencies need to share intelligence, evidence and administrative data in real time, as events unfold. The coronial inquest into the Sydney siege revealed the operational problems created when police and security agencies fail to share information on an offender quickly and openly. The benefits of improving information-sharing may be obvious, but the success of any changes to law or policy will depend heavily on buy-in from the agencies. Complex privacy law requirements can make agencies reluctant to share personal information about an offender. This is exacerbated if they remain culturally resistant to sharing their information. 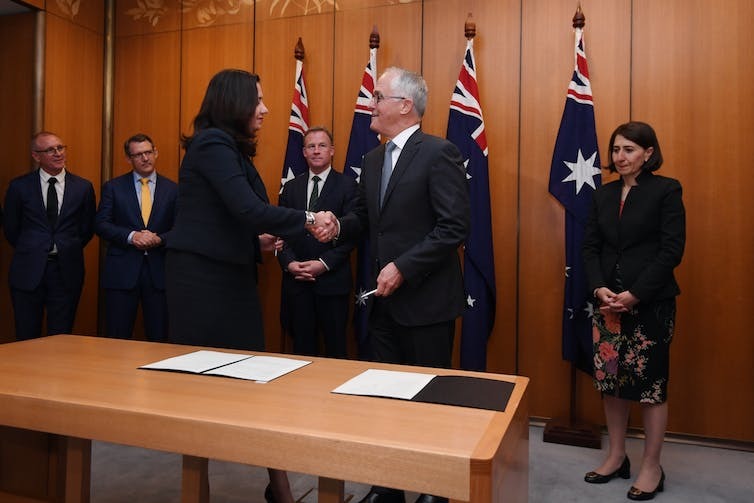 COAG revealed there will be greater sharing of biometric data and facial recognition technology across state boundaries. Agencies in all jurisdictions will have access to facial recognition software that can match CCTV footage with passports and other identity documents. The full capability of this technology is not yet clear. However, it is already raising concerns about increased scrutiny of Australian travellers and the possibility of criminals hacking biometric databases. Pre-charge detention is the amount of time police can detain a person following their arrest and before they must be charged and brought before a court. During that time, the arrested person may be questioned and the police may collect additional evidence. Currently, the maximum limit of pre-charge detention for terrorism offences differs across Australia. Under federal law, the maximum is eight days (including so-called “dead time”, which can be excluded for administrative purposes). In New South Wales, it’s 14 days, while in other states it’s seven days or less. The federal government is proposing to raise the limit in all jurisdictions to 14 days. Consistency in pre-charge detention for terrorism is welcome. There is no reason why NSW Police should be able to detain a terrorist offender for more than twice as long as police in other states. However, the government has not made a strong case to justify why the longest period of pre-charge detention should be applied across the board. Prime Minister Malcolm Turnbull offered the recent Sydney terror raids as an example of why the changes are needed. That case involved a more rushed police investigation following a tip-off from an overseas intelligence service, as well as complex physical evidence including explosives and chemicals. Even in that complex case, it seems that nothing close to a 14-day limit was required. One man was released without charge after three days; two more were charged with terrorism offences within five days, and the fourth man was charged with a non-terrorism offence after eight days. The appropriate upper limit on pre-charge detention is unclear, but the risks of lengthy pre-charge detention are evident. In 2007, Mohamed Haneef was detained for 12 days for an alleged connection to an attempted attack on Glasgow International Airport. He was released without charge and later received an undisclosed sum as compensation for the bungled investigation. In response to the Haneef affair, the Rudd government placed a seven-day limit on the amount of dead time that could be claimed by police. This was done to prevent these kinds of mishaps from happening again. Two new criminal offences have also been proposed: one for possessing terrorist instructional materials, and another to strengthen offences for “hoax” attacks. It is not clear why an offence for possessing instructional materials is needed, as multiple similar offences have existed since 2002. Under the Commonwealth Criminal Code, it is a serious offence to collect or make documents likely to facilitate terrorism, to possess any “thing” connected with preparation for terrorism, or to train with a terrorist organisation. Following the post-9/11 anthrax scares in the US, offences for “hoax” terror attacks were also introduced in Australia. These laws make it an offence to phone in a fake bomb threat or post a substance through the mail, where doing so would induce a false belief of terrorism. And, by virtue of Australia’s broad statutory definition of terrorism, all terrorism offences apply to the “threat” of an attack. These proposed changes have more to do with “getting tough” on terrorism than with filling gaps in the criminal law. After seeing Turnbull flanked by special forces soldiers and now tactical response police, one wonders whom he will pose with next. The asylum seeker controversy in Australia is deepening, with four more deaths after another tragedy at sea last night. There is yet another boat in distress right now as well. Compassion would seem to be much in need from where I sit, yet most Australians seem to have very little when it comes to the plight of refugees and/or asylum seekers. Still, an election can’t be too far away as the various parties begin the usual pledges to spend money on this and that – certainly infrastructure needs are great in this country. Meanwhile Kevin Rudd has held a community cabinet meeting overnight. The link below is to an article reporting on persecution news from Algeria, where Christians are seeking to have their meeting places returned to them. The link below is to an article reporting on the latest developments in the plan to arm Syria’s rebels. The following article reports on the grenade attack on a Christian meeting near Mombasa in Kenya. The following article reports on the grenade attack on a Christian meeting near Mombasa in Kenya. It is thought that Islamic extremists linked to al Shabaab group carried out the attack.